We really love fall and winter squash in the US! They are crammed with antioxidants, fiber, carotenes and Vitamin A. They are very filling with very few calories and can be prepared in countless ways. Plus, in fall, they are in season and are very inexpensive. But what are the best ways to buy, prepare and cook various types of squash? Butternut squash is tasty but can be hard to chop up, and some of the other types look rather gnarly and scary, so what to do? The best squash is going to feel rather firm and heavy and not have any soft spots. A squash that is fully grown has a rather dull skin and is not glossy. The flesh tends to be rather sweet. Look for a rich, deep color on the outside and a dry stem that is attached if you can. We find that a good fall or winter squash can be kept up to three months if it is kept in a dark place. A butternut squash can be a bit of a challenge because it has an oblong shape. To cut it in half, cut off the top and the bottom so that is will sit flat on your cutting board. Put it on the wide end and slice it vertically. If you have any resistance, you can try a mallet and tap it on both sides of the knife. If you have a spherical squash, you can cut in a circle round the stem and angle at an inward angle then then scoop out the seeds. We find that many winter squash have thick skin and so you are going to need to use a big knife. No matter what kind of squash you have, you will need to scoop out the guts of the squash with your spoon. If you want to have a really nice treat, rinse off your seeds in the colander and shake them dry. Spread the seeds on your cookie sheet, drizzle with oil and sprinkle with salt. Roast them at 300 degrees for 20 minutes or until they are brown. Peeling squash can be a pain but for many recipes, it is important. If you want to roast squash cubes, there is nothing better than that caramelized flavor of the browned, irregularly shaped pieces. So you will want to take a few minutes to smooth the knobs and to get into the divots with your peeler or slicer when the squash is still in one whole piece. If you are cooking the squash in a way that is not as dependent upon texture, you should leave on the skin and bake it. Cut it in half and bake it at 300 degrees, cut side down until it is so soft it can be peeled off. You also can pour boiling water over the squash in a dish to help get that skin off. 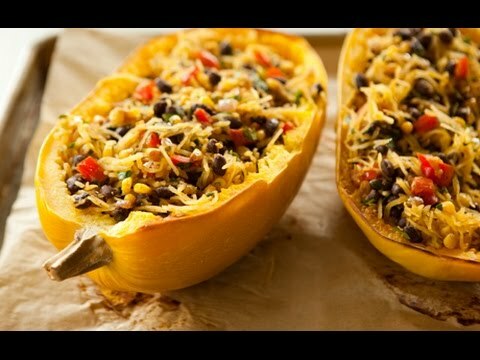 There are few bad ways to cook a squash! They are really good steamed, pureed, broiled, boiled and baked, also fried and mashed. Cut your squash in half, make sure that you cut off the stem and cut out the innards. Score the flesh of the squash with a fork, and then brush and spray until all of the surfaces are coated with oil. Sprinkle the cut sides with salt and put it face down on your cookie sheet. Roast it for 45 minutes. After it is cooked, peel off the skin then cut it up and serve!